the intrinsic accuracy and performance of the measuring instrument. This article will address each of these areas with the objective of providing guidance in achieving optimum accuracy in making high-voltage measurements. Accurate high-voltage measurement is needed in all of these applications and in the calibration labs used to maintain these instruments. THE 4700 SHOULD NOT BE USED IN AN ENVIRONMENT WHERE CONDUCTIVE POLLUTION CAN OCCUR, E.G. IN AN OUTDOOR ENVIRONMENT. IF FLUIDS OR OTHER CONDUCTIVE MATERIALS ARE ALLOWED TO ENTER THE UNIT ENCLOSURE, EVEN IF NOT POWERED, THEN THE UNIT SHOULD BE IMMEDIATELY TAKEN OUT OF OPERATION AND SERVICED AS SAFETY MAY HAVE BEEN COMPROMISED. IF THE UNIT IS TRANSPORTED BETWEEN DIFFERING ENVIRONMENTS AND CONDENSATION IS SUSPECTED, THE UNIT SHOULD REMAIN UNPOWERED FOR SUFFICIENT TIME FOR CONDENSATION TO HAVE DISSIPATED. WHEN AC VOLTAGES ARE PRESENT, EVEN IF THERE IS SUFFICIENT INSULATION ON THE CONNECTIONS, THERE MAY BE SIGNIFICANT CAPACITIVE COUPLING WHICH CAN CAUSE AN UNSAFE CURRENT TO FLOW INTO NEARBY OBJECTS AND ALSO CORONA MAY OCCUR EVEN OUTSIDE OF THE INSULATION. THESE EFFECTS ARE MADE WORSE BY SHARP CORNERS. IN SEVERE CASES CORONA CAN CAUSE INTERFERENCE WITH THE MEASUREMENTS OF THE 4700 AND WILL REDUCE THE CAPABILITIES OF THE WIRING INSULATION OVER TIME, EVENTUALLY RESULTING IN INSULATION FAILURE. Full accuracy specifications are valid assuming that there are no objects within a cylinder of radius 18” centered on the probe body extending from the handle (or base) to a point 6” beyond the probe tip. The connection to the probe tip is assumed to extend from the probe tip in line with the probe for at least 6”. Typically, the effect of a hand-sized grounded object is <0.01% at 60Hz when placed 4” from the probe and <0.1% at 400Hz when placed 18” from the probe. As long as objects do not move relative to the probe, there is negligible effect on DC measurements caused by nearby objects. Objects generating fields may need to be placed further away from the probe than these figures. At higher voltages, the radius increases. For the 150 KV probe the radius of the cylinder increases to 48”. WARNING – THE 4700 MEASURES VOLTAGES OF UP TO 10kVrms ON THE DIRECT TERMINAL. THESE VOLTAGES CAN CAUSE SEVERE INJURIES OR DEATH. THE USER MUST ENSURE THAT CONNECTIONS TO THESE HAVE SUFFICIENT INSULATION FOR THESE VOLTAGES. EVEN WHEN SUFFICIENT INSULATION IS PRESENT, THE USER SHOULD NOT PUT ANY PART OF THEIR BODY IN PROXIMITY TO THE CONNECTIONS WHILE HIGH VOLTAGES ARE PRESENT (AT LEAST 1 INCH PER KV IS RECOMMENDED). THE USER SHOULD NOT INSERT OR REMOVE ANY CONNECTIONS TO THE 4700 WHEN HIGH VOLTAGES ARE PRESENT. WARNING – DO NOT APPLY HIGH VOLTAGES TO A PROBE WITHOUT IT BEING PROPERLY PLUGGED INTO A 4700. 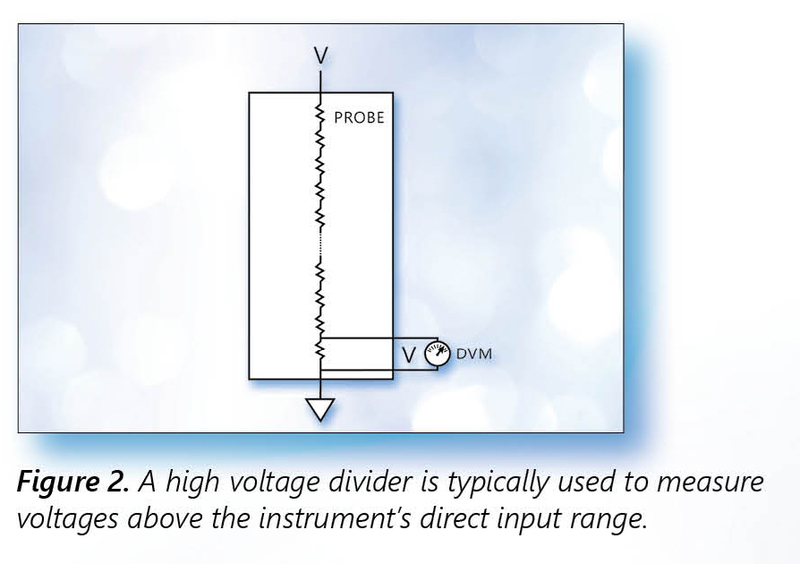 When measuring higher voltages, an external probe is used. The most common type of probe utilizes the method prescribed in a NIST document with details on utilizing a voltage divider network to reduce the voltage applied to the meter to within its basic input range (Figure 1). The voltage divider is comprised of a series of identical precision resistors. For example, a 100:1 voltage divider would allow an instrument with a 1 KV max input to measure an applied voltage of up to 100 KV. In order to mitigate these effects, a series resistor voltage divider would typically take on a configuration like the one shown in Fig. 3. The resistors in the array would be arranged in a helical fashion to reduce errors from electromagnetic and thermal factors. The voltage divider network is susceptible to a number of error-producing effects, among them, self-heating, capacitance effects on AC measurements and electromagnetic effects. Voltage divider probes must be calibrated with the meter. Calibration should also identify sources of uncertainty. “For highest accuracy in high impedance, low input capacitance types, consideration must be given to induced voltage pick-up in leads, contact potential, corona, effective capacitance, and voltage gradient and capacitance shift related to proximity to high voltage sources, ground planes, walls, enclosures, and loads. 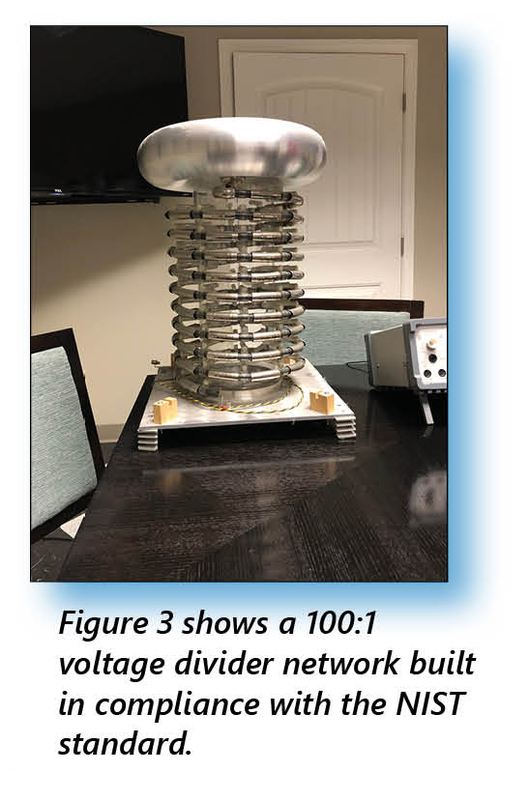 An alternative, and perhaps more elegant solution is to connect the source to a single high resistance and measure the microampere current. This, of course, requires the precision “voltmeter” to also operate as a, low-impedance, precision ammeter. 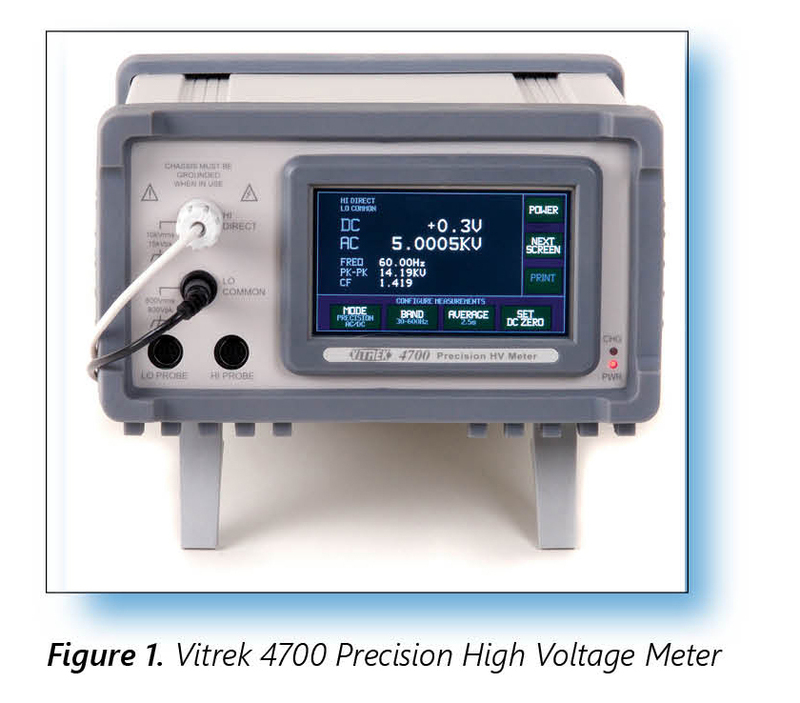 This alternative is utilized in each of Vitrek’s high-voltage Smart Probes (Figure 3). 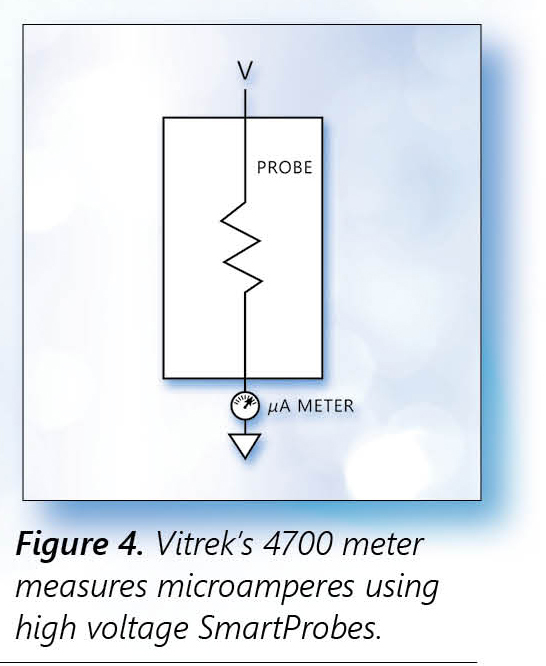 Unlike voltage dividers that must be calibrated with the meter, these smart Probes include calibration data that is automatically updated when the probe is connected to any Vitrek 4700 meter. Most precision high-voltage meters are capable of direct measurement; i.e., without requiring an attenuating probe, for voltages of up to 1000V. An example of this type of meter is the Fluke 8846A 6.5-digit precision multimeter. Meters like this typically have a measurement range of 100mV to 1000V with excellent accuracy specs. However, for voltages between 1000V and 10 KV, meters in this class must utilize an external probe. A great many high voltage measurements (both AC and DC) are found in the “lower” high-voltage range of greater than 1000V and less than 10KV. Examples of devices that can accommodate direct input within this voltage range are the Kikisui 149-10A and the Vitrek 4700. A quick comparison of these two units provides insights into features and functions that may be important based on the nature of the application. While both instruments offer high accuracy it is clear that the Vitrek 4700 is capable of making more accurate measurements. Moreover, as with many instruments, the Kikisui has a single digital display while the Vitrek 4700 has a multifunction digital display panel. The ability to monitor both AC and DC voltages, frequency and current simultaneously may be of importance in some applications. Wide frequency range may not be necessary in making AC measurements, but here again, if required, the Vitrek unit is capable RMS readings over a very wide frequency range. For example, very low frequency (VLF) AC is applied when testing transmission lines for corona effects. And higher frequencies are needed in some medical and aerospace applications. Precision high-voltage measurements require careful attention to the environmental conditions, the proper application of high-voltage probes and the basic functions and features of the meter. Careful selection of a highly functional meter can provide both flexibility in application and reduce the need for multiple meters.